Auditions can be so super scary! They are all about going into blind situations where people you don’t know will be writing down their opinions of you, and the audition could either go really well, or horribly wrong. There are so many things that can happen, for better or for worse! And who knows, you could either get the part and land a job, or completely tank it and have the whole thing be a huge giant flop. But what are some of the things that might possibly go wrong? And how can you as an actor avoid them? 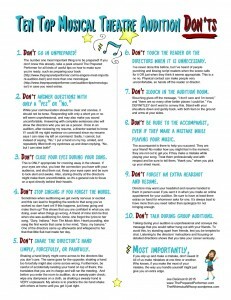 I’ve gathered up the Ten Top Musical Theatre Audition Don’ts, so you can go into that audition room and nail it! 1. Don't go in unprepared! The number one most important thing is to be prepared! If you don’t know this already, take a peek around The Prepared Performer for all kinds of useful tips on how to make sure you’re ready, such as preparing your book [add link] and more than one monologue [add link] in case you need extras. 3. Don’t close your eyes during your song. This is ONLY appropriate for crooning away in the shower. If your eyes are shut, you lose the connection you have with your audience, and shut them out. Keep your eyes open and be sure to look alert and awake. Also, staring directly at them makes them uncomfortable, so focus on a spot directly behind the director’s/s’ head/s. 4. Don’t stop singing if you forget the words. Sometimes when auditioning we get overly nervous or excited and this can lead to forgetting the words to that song you’ve worked so darn hard on! If this happens, just keep going and make them up! This shows that you are confident in what you are doing, even when things go wrong. A friend of mine told me that when she was auditioning for Annie, she forgot the lyrics to her song, “Gary, Indiana,” from The Music Man. Heart pounding, she sang the first words that came to her mind, “Gary, my banana.” One of the directors came up afterwards and whispered to her that that little flub had made her day. 5. Don’t shake the director’s hand limply, forcefully, or painfully. Shaking a hand limply might come across to the directors like you don’t care. The same goes for the opposite; shaking a hand too forcefully might also come across wrong. Also, be careful of accidentally twisting your hand on top of theirs; this translates that you are in charge and will run the meeting. And before you enter the room to audition, do a sweaty-palm check; wipe any dampness on a cloth, as shaking a sweaty hand is VERY unpleasant. My advice is to practice the ole hand shake with others at home until you get it just right. 6. Don’t touch the reader or the directors when it is unnecessary. I’ve never done this before, but I’ve heard of people punching and kissing the readers when the script calls for it or at the moment where it sounds appropriate. Physical contact can make people very uncomfortable, so hands off the reader or director. 7. Don’t slouch in the audition room. Slouching gives off the message, “I don’t care and I’m bored,” and “there are so many other better places I could be.” You DEFINITLEY don’t want to convey this. Stand with the shoulders down and gently back, with both feet on the ground and arms at your sides. 8. 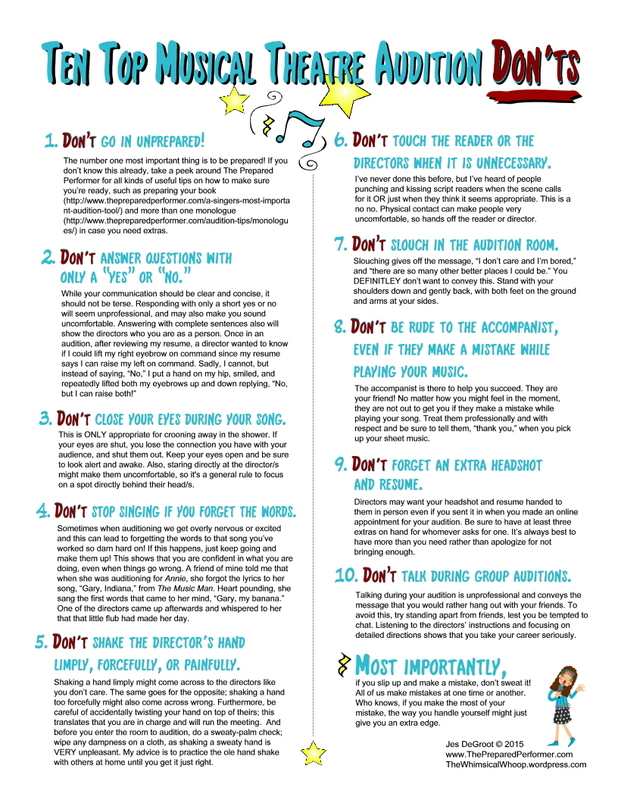 Don’t be rude to the accompanist, even if they make a mistake while playing your music. The accompanist is there to help you succeed to the best of your abilities. They are your friend! No matter how you might feel in the moment, they are not out to get you if they make a mistake while playing your song. Treat them professionally and with respect and be sure to tell them, “thank you,” when you pick up your sheet music. 9. Don’t forget an extra headshot and resume. Directors may want your headshot and resume handed to them in person even if you sent it in when you made an online appointment for your audition. Be sure to have at least three extras on hand to present one to whomever asks for one. It’s always best to have more than you need rather than apologize for not bringing enough. 10. Don’t talk during group auditions. Talking during your audition is unprofessional and conveys the message that you would rather hang out with your friends. To avoid this, try standing apart from friends, lest you be tempted to chat. Listening to the directors’ instructions and focusing on detailed directions shows that you take your career seriously. Most importantly, if you slip up and make a mistake, don’t sweat it! All of us make mistakes at one time or another. Who knows, if you make the most of your mistake, the way you handle yourself, might just give you an extra edge.